I’m sure most of America thinks the threat of Ebola has passed. Nope. Just this morning I heard of 46 in Minnesota being quarantined. But that pales in comparison to New York City, whose quarantined have tripled in a week to 357. The reason you are not hearing this is that media outlets are in cahoots with the Obama Administration and the CDC to hush it up until a positive viral RNA test is completed. That includes Fox News folks. At the urging of the Obama Administration, the Associated Press and other news outlets have agreed not to report on suspected cases of Ebola in the United States until a positive viral RNA test is completed. The administration and liberal activists were upset with coverage in the run-up to the midterm elections. Who said political hack Ron Klain was not a good pick for Ebola czar? 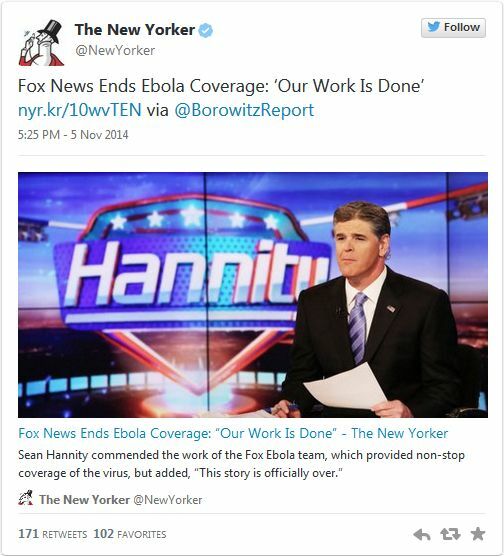 In case you haven’t noticed… Media outlets are no longer reporting on suspected Ebola cases at the urging of the Obama administration. That damning line is buried deep in the article so anyone can be excused for not noticing it – they aren’t supposed to. What are they going to do? Wait until bodies are stacking up in the hospitals, streets and in their homes before they tell anyone? Then say, “We had no idea.” If media reports on this in defiance, will it turn into The Stand, where they shot the reporters who got the word out? If I were a journalist, with ethics that is, I would make it my life’s quest to expose this. I hear a Pulitzer calling to some print hound out there. How dare our government silence news on a growing pandemic – every day it feels more like fascist Russia in the States rather than the former freest nation on Earth.